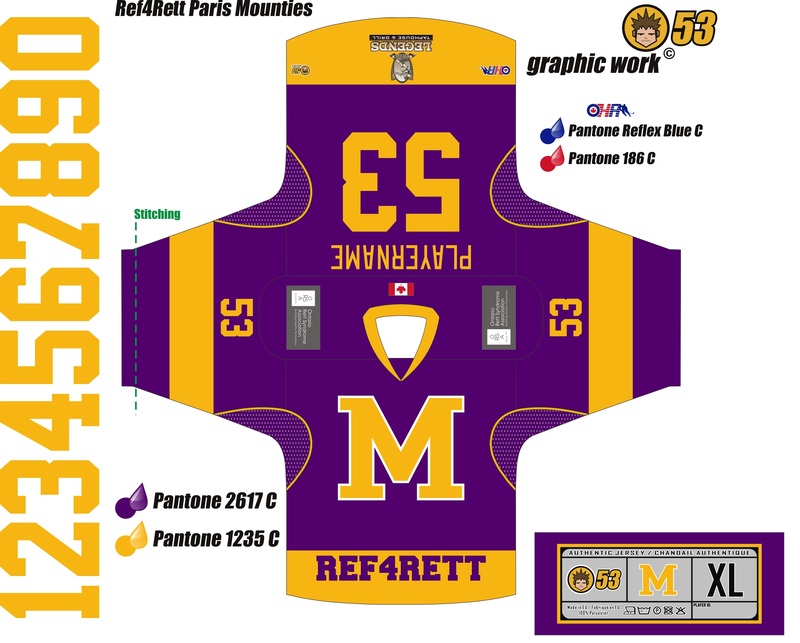 We are pleased to release the customs Ref4Rett jerseys for the Paris Mounties Jr.C team that will be worn at the 3rd Annual Ref4Rett event, which is also the last regular season game for the Mounties against the Ayr Centennials on January 31, 2015 at the Brant Sports Complex. These jerseys will be included in the Silent Auction at the event. Also, you can still bid on the opportunity to coach the Toronto Maple Leafs Alumni team during the Alumni game. Click on the link if you are interested in placing a bid on this once in a lifetime opportunity,http://ref4rett.myevent.com/3/auction.htm. Tickets to the event are $20 each and include admission to both games. Tickets will be available at the door or prior to the event at the following locations: Legends Taphouse & Grill, during the Paris Mounties Home Games at the Brant Sports Complex or by emailing us at ref4rett@gmail.com. Along with the great hockey and silent auction, there will be an autograph session with the Leafs Alumni after their game.